The Orbit 3 brass pocket compass is a small compass that offers a handy way to keep your bearings about you. The dry compass capsule houses an agate-bedded compass needle inside an azimuth ring featuring 2 degree resolution. And now this compass features a needle-stop lock (see the little black lever on the side), so the needle doesn't bounce around while it's in your pocket. 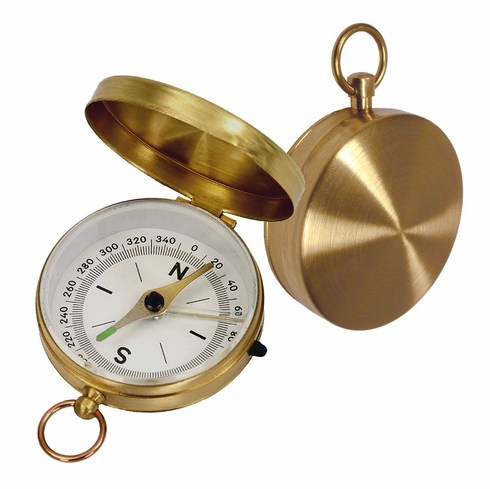 The exterior of this compass features a brushed gold appearance, less susceptable to finger prints. Important to note is that this simple compass does not have a closing latch. The lid fits snug around the compass body and must be pulled apart manually. For a pocket compass of comparable size with a closure latch, please see the Dalvey Miniature Pocket Compass. Both sides of the compass exterior and the interior lide are free from any markings and may be engraved lightly (Warning: deep engraving could pierce the surface. Engraving services are not available through The Compass Store. Please see your local engraver for an assortment of engraving capabilities on brass.